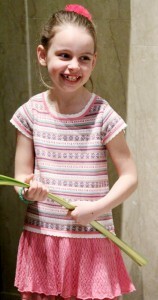 Baby Lara Kuttab receives the archbishop's blessing after Mass as her mother Nawaf carries her, and some palm. 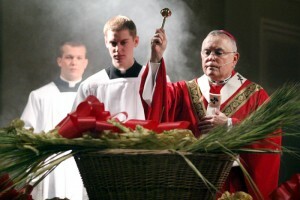 Archbishop Charles Chaput celebrated and preached the homily for two Masses on Palm Sunday, April 13, at 11 a.m. and 6:30 p.m., at the Cathedral Basilica of SS. Peter and Paul, Philadelphia. 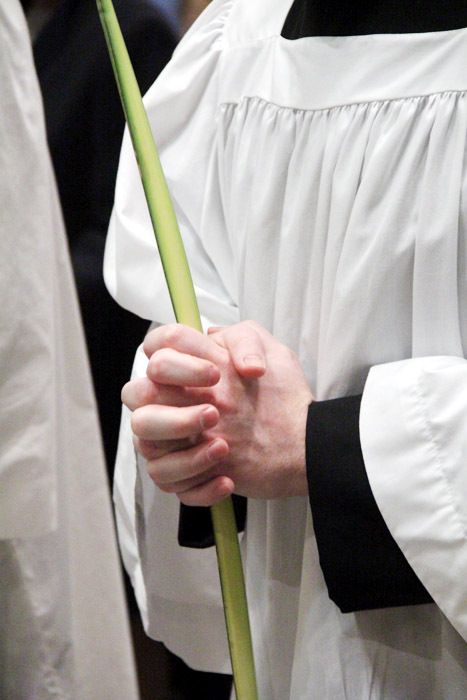 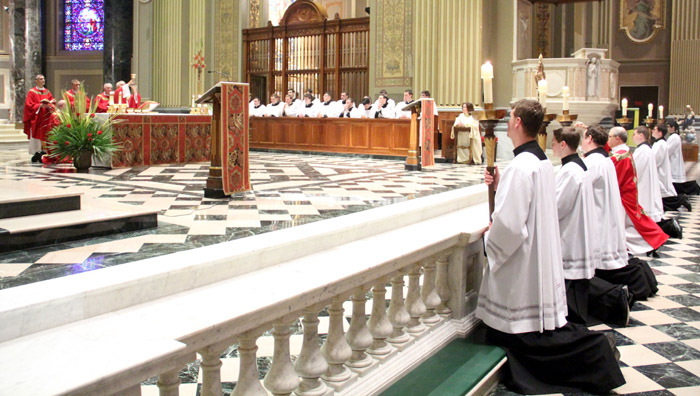 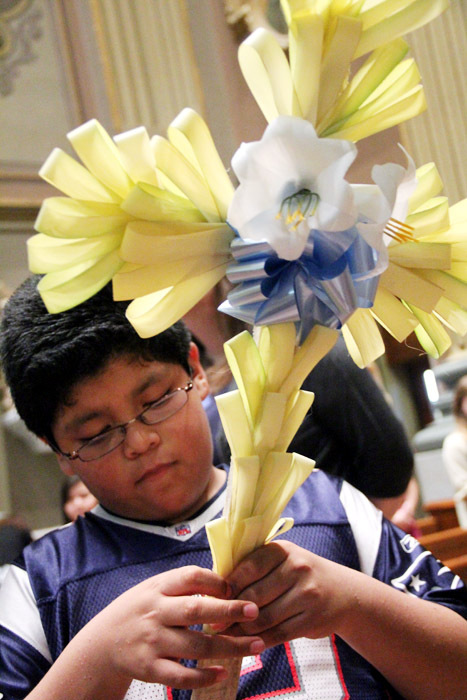 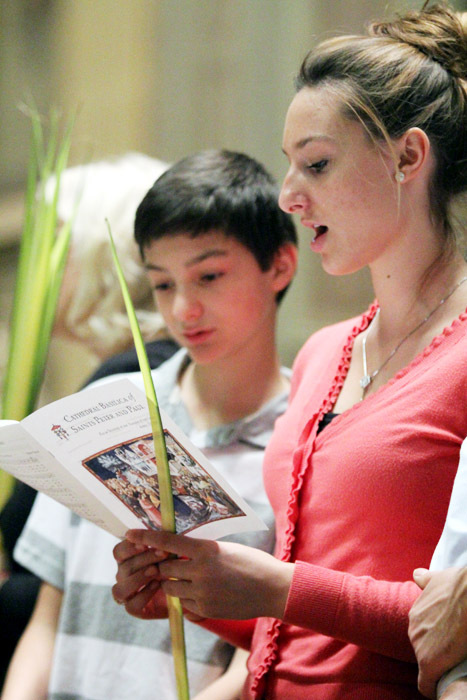 Our photo gallery by Sarah Webb shows scenes from the morning Mass. Palm Sunday commemorates Jesus’ triumphal entry into Jerusalem and the proclamation of the Passion, and marked the beginning of Holy Week. 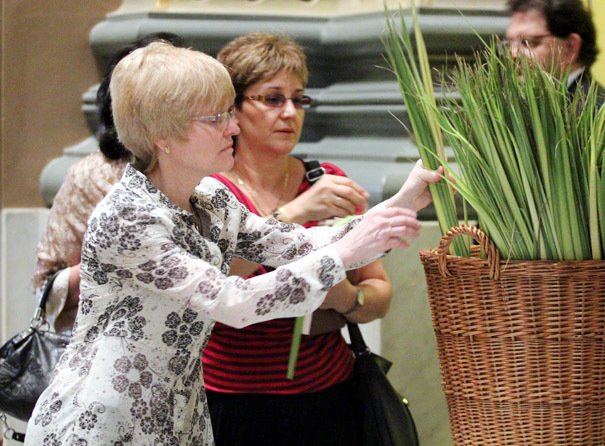 Tina Haydu (left) from Infant Jesus Parish in Woodbury, N.J., (Diocese of Camden) selects palm to take home. Deldora Husanu from the Cathedral Parish is glad to have her palm. 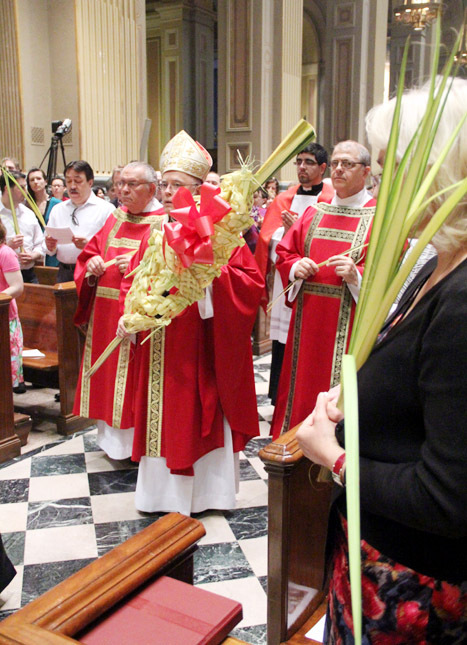 The archbishop blesses palms to be used during Mass and distributed to people afterward. 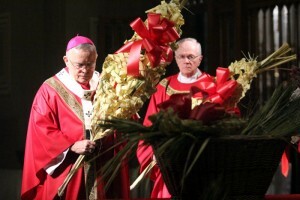 Archbishop Chaput and Msgr. Arthur Rodgers, rector of the cathedral, carry their palms. Michael and Adda Cieslak from SS. Phillip and James Parish in Exton sing together during Mass. The archbishop and deacons walk up the cathedral’s center aisle during the entrance procession for Mass. 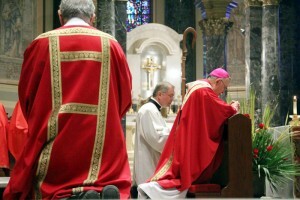 The Gospel is proclaimed by a permanent deacon at the Cathedral. 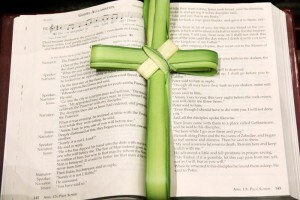 All knee during the proclamation of the passion when Jesus gives up his spirit on the cross. 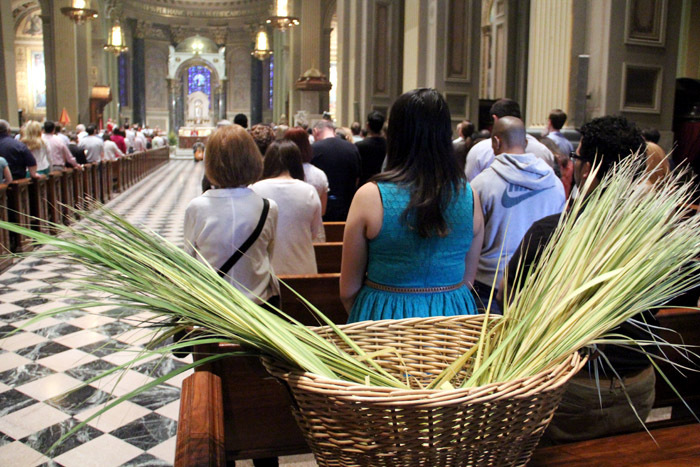 Michael Justo from St. Thomas Aquinas Parish in Philadelphia attended Mass with his family. 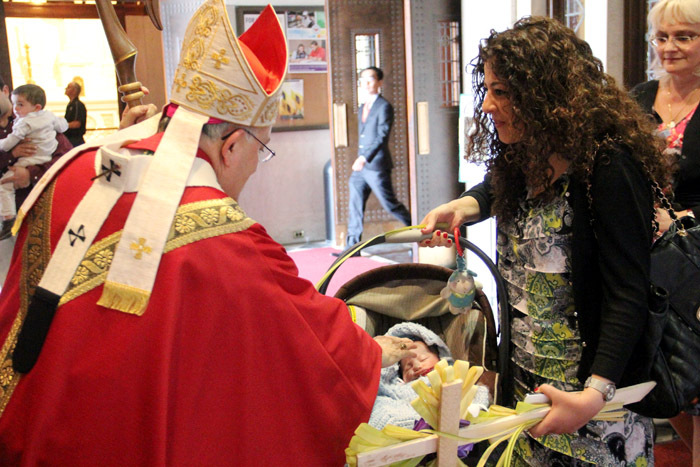 Baby Lara Kuttab receives the archbishop’s blessing after Mass as her mother Nawaf carries her, and some palm.